So Flippin Cute is a reversible skirt pattern with a cute gathered elastic waist. Options include contrast hem and of course, pockets. Not too full, not too flat, perfect for every day wear. You’ll love the clever construction that encloses all seams, no hand-sewing needed! ELEVEN sizes included in this value-priced wardrobe builder: 12-18 months, 18-24 months, 2T, 3T, 4T, 5, 6, 7/8, 9/10, 11/12 and 13/14. Recommended sewing experience: An easy and quick sew with no gathering needed. Beginner/Advanced Beginner. No printing needed, all measurements you need given as charts in the pattern. But if you like to print, we’ve got you covered there too! Printable pattern pieces with a quick-print chart and print-only-your-size layers available too. 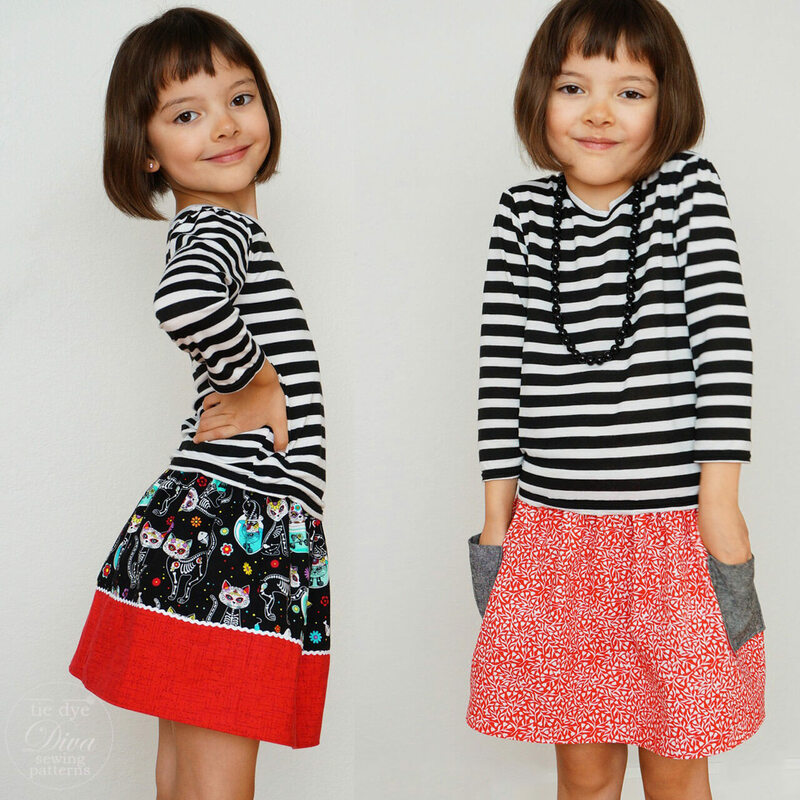 Our model’s tops are made with our Garnet Top, Dress, and Skirt pattern and our Peasant Top Pattern for Girls. You will receive your reversible skirt pattern as an instant download PDF upon purchase, and you will need Adobe Reader to view it and regular 8.5” x 11″ or A4 printer paper and a printer for printing the patterns. No paper copy of the pattern will be mailed. You may sell what you personally make with Tie Dye Diva sewing patterns. The reversible skirt pattern itself is copyright protected and use is restricted to the purchaser only.